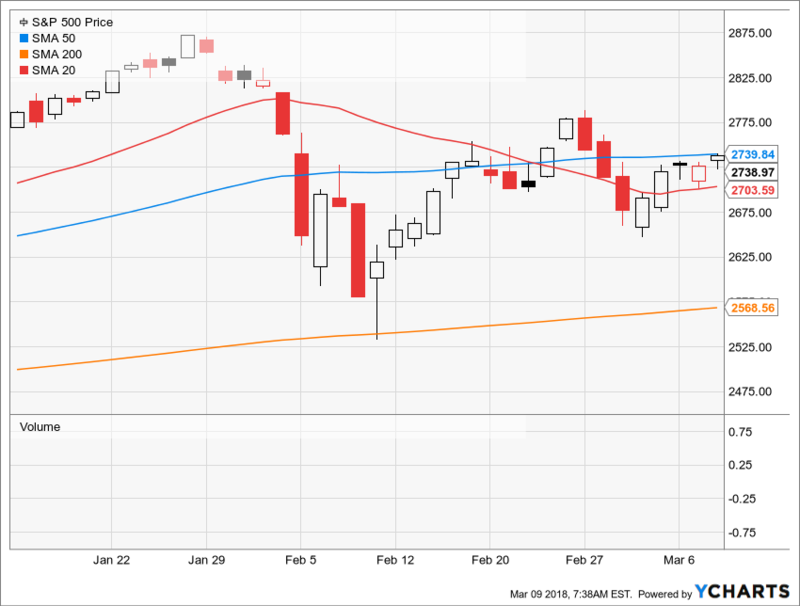 As we also noted as per the chart point mavens, the 20-day average down at 2703 (red line) on the S&P 500 was supposed to represent “support” while the 50-day average (blue line) purportedly functioned as “resistance”. Well, upon the official announcement of the Donald’s lunatic trade war, there she sat at yesterday’s close – less than one point under the 50-day moving average at 2739.8 (blue line). But rather than “resistance”, which the raging robo-machines ripped through today like a hot knife through butter, we’d say the blue line represents the last frontier of sanity. That’s because a stock market trading at 25X earnings under today’s baleful circumstances is nothing less than a brobdingnagian bubble (i.e. a huuuge one) frantically searching for the proverbial pin. We essay the razor sharp aspects of the pin below, but suffice it to say here that the cyclical calendar has just plain run out of time. It is way, way too late in the cycle at 105 months of age to be “pricing-in” anything except the end of the party. And this bubblicious party has embodied the most spectacular central-bank fueled mania yet – meaning that the morning after is going to bring a truly hellacious hangover. the swaying giant red elephant in the global economic room – meaning China’s historically unprecedented and freakish explosion of debt, manic building, monumental speculation, systematic lying and fraud and serpentine centralized command-and-control that is destined to end in a spectacular implosion. Yet the financial system has been so corrupted by the central bank’s long-running regime of financial asset inflation and price falsification that it no longer recognizes anything that is important, fundamental and persisting. Instead, owing to the cult of an ever rising stock market, Wall Street is hopelessly enthrall to regency bias and context-free short-term deltas in the incoming monthly data. The latter are virtually meaningless under today’s central bank driven Bubble Finance regime, of course, because the direction of economic causation has been reversed. To wit, clumsy central banks in the pre-1987 world often fueled overheated credit on main street. Rising wage and consumer inflation then forced them to garrote the banking system, thereby triggering a collapse of housing, big ticket durables and CapEx. So the early onset warning indicators and the eventual fact of main street recession caused the stock market to dive. By contrast, in a debt saturated global economy run by a linked-convoy of central banks, monetary “stimulus” does not inflate main street or real economies when they are impaled on Peak Debt. It simply inflates monumental financial bubbles in the money and capital markets – ever expanding bubbles which eventually burst. Consequently, neither central bankers nor Wall Street ever see these new style recessions coming because, in fact, they can’t be detected from even an astute reading of the macro-economic tea-leaves. Self-evidently, that’s because the triggers for recession are embedded in the interstitial bubbles of the financial markets; and while the latter may be obvious to the outsider or even a visiting Martian, they are adamantly denied by the Wall Street stock peddling apparatus and are invisible to the Fed’s financially clueless Keynesian academics and policy apparatchiks who remain glued to their macroeconomic dashboards. Alas, the sheer resilience of main street capitalism keeps these dashboards mostly flashing green, most of the time. And it doesn’t take much to impress the bubble-besotted financial commentariat and day traders, as this current anemic recovery has amply demonstrated. 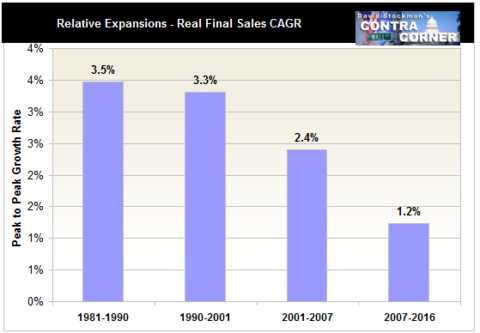 In a system so addled by phony bubble wealth, in fact, it apparently doesn’t even matter that the current expansion has generated real final sales growth of only one-third its historic rate; and that even the 1.2% growth rate shown below probably overstates the case owing to systematic and deliberate under-measurement of inflation by Washington’s officialdom. 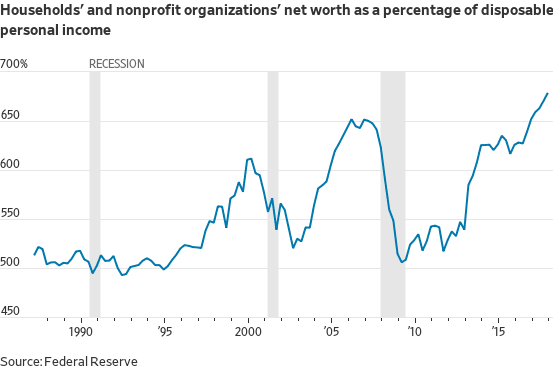 Stated differently, the macroeconomic “new normal” has been so tepid that it has barely lifted the main street economy out of the deep hole trigged by the last financial bubble meltdown in 2008-2009. Yet as long as the monthly indicators show a smidgeon of green – as capitalism trudges uphill against the headwinds of debt and central bank induced strip-mining of corporate cash flows and balance sheets – it is apparently enough to keep the recovery narrative going. Needless to say, we had a classic case of that this AM with the so-called “blow-out” jobs print at 313,000 for the month of February. Indeed, that number seems pretty impressive – that is, until you read the fine print on the chart below. As it happened, the March 2006 high water mark depicted above, was not recovered until May 2013 – seven full years later! Needless to say, back then that did not stop the talking heads of bubblevision from celebrating the Goldilocks Economy and claiming that it was smooth sailing ahead because there wasn’t a hint of recession in sight. The corporate mayhem only stopped in mid-to-late 2009 (i.e., that’s when the massive monthly layoffs and inventory liquidations essentially ended) when Bernanke’s tripling of the Fed’s balance sheet caused the stock market to begin to convincingly reflate. 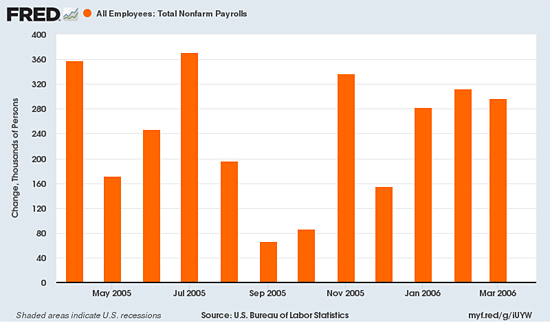 It is also worth noting that the BLS report made its last monthly print at 300,000 in March 2006 (actually it has now been revised multiple times to 297K, which is close enough for government work). That was month #52 of the Greenspan/housing expansion. By contrast, the US economy is now in month #105 of the Bernanke/Yellen Everything Bubble. Still, during the last 12 months there have been only two 300,000+ prints and the average monthly employment gain has been just 190,000. 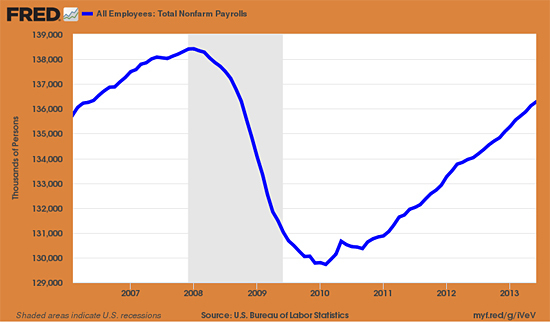 That’s 21% below the 240,000 average in the 2006 chart above, and it’s in a context in which the potential labor force has grown by 29 million or 13%. Likewise, back in 2006 the Red Ponzi was still in its relative infancy, the Fed had restored some semblance of sanity to the money market with the funds rate at 5.25% by mid-2006, and no one had yet heard of the idea of QT (quantitative tightening) because QE (quantitative easing) has not yet been invented – at least in the US context. Stated differently, the Fed’s balance sheet was about $700 billion and had plenty of headroom to the upside. Now it is trying to crawl off the ledge at $4.4 trillion – with a destination at +/- $2.5 trillion, as the new Janet in ties and trousers explained to the Congress last week. 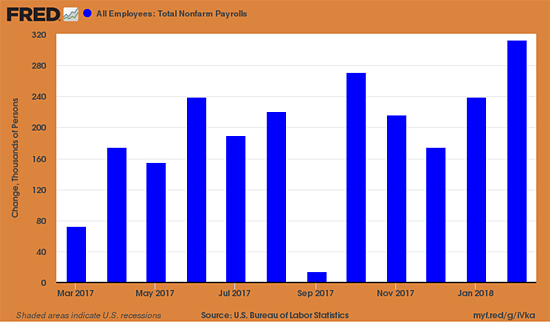 In as word, we don’t think the February print means anything at all – not in month #105 of a feeble business expansion which is confronting all of the headwinds described above. But as we shall explore further next week, here is the ultimate measure of Wall Street’s big, bloated, manic bubble begging to find the pin. But here’s the thing. 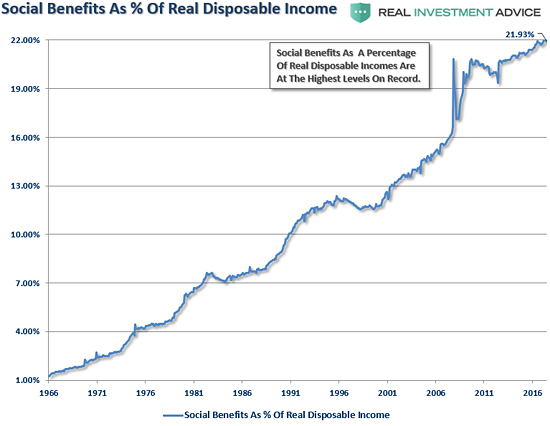 The underlying level of income, which is now effectively capitalized at a record 6.8X is the lowest quality income in modern times. Fully 22% of it is accounted for by transfer payments – a figure which has more than doubled since the turn of the century. Yet how can you capitalize at more than 0.0X “income” that is extracted from producers, not generated by new output and wealth? So the Great Pin is surely coming – and it may be wielding torches and pitchforks when it arrives.